This classic southern cake is full of pineapple, banana, and pecans and iced with a creamy cream cheese frosting. This snack cake version is easy mixed in just one bowl and oh so moist. Make sure to use a ripe banana. Choose one that is deep yellow with some brown speckling. For Cake: Adjust oven rack to middle position and preheat oven to 350°F. Lightly grease 9- by- 9-inch baking pan. Whisk eggs, sugar, salt, and banana in a large bowl until completely combined. Whisk in pineapple (with liquid) until combined. Add the flour, baking soda, cinnamon, and chopped pecans to the bowl, and then whisk until completely combined. Pour into prepared pan and bake until top is set and toothpick inserted into the center comes out mostly clean with a few moist crumbs, 35 to 40 minutes. Transfer pan to wire rack to cool completely, about 2 hours. Wash bowl. For Cream Cheese Frosting: In the same bowl (washed), stir cream cheese and sugar until combined. Whisk briefly until smooth. Gently whisk in rum (or milk). 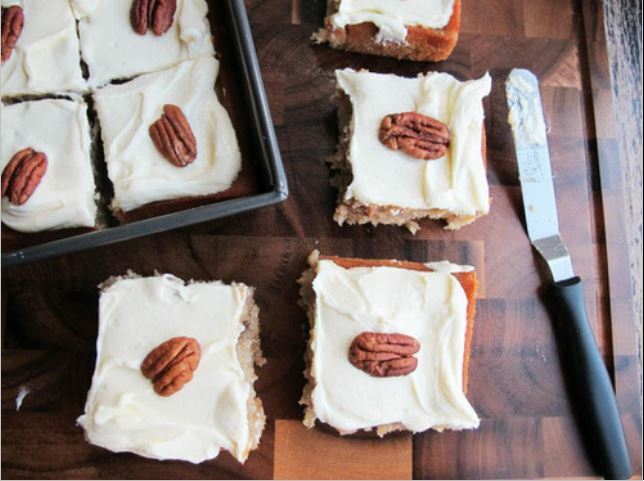 Spread over cooled cake and top with reserved pecan halves.